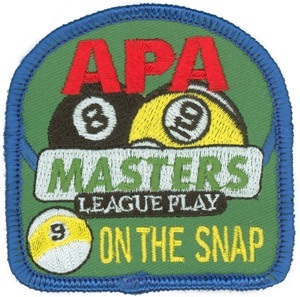 NOLA APA awards patches for their members free upon request each time they have a Break and Run in 8-or-9 ball or make an 8-or-9 ball on the snap. Other patches are available for order. Please make note on the back of your score sheet. Your order MUST include the fee for each patch/pin. (Patches and pins may differ slightly from those shown below). 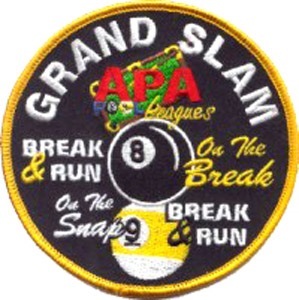 8 on the break and 9 on the snap simply require that the breaking player sinks one of these balls on the break shot. 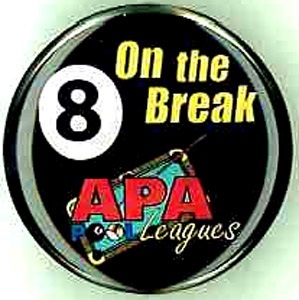 Of course 8 on the break only applies to 8 ball and 9 on the snap only applies to 9 ball. 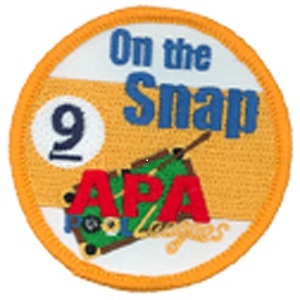 These patches are awarded to our members free if requested. Pins are also available if you prefer, they are $3.00 each. 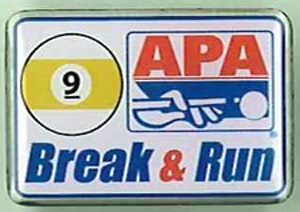 A break and run is exactly what it says. 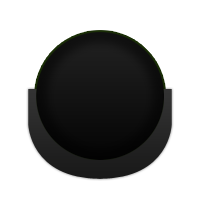 The player must break and then pocket every ball in his or her category in 8 ball. 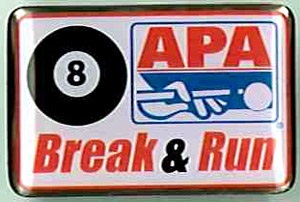 In 9 ball, the player must break and pocket every ball on the table. 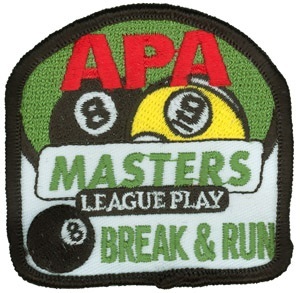 These patches are awarded to our member Free if requested. 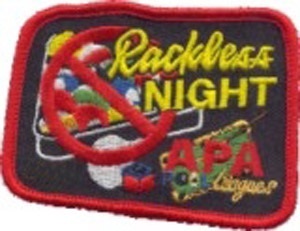 A rackless night patch is awarded when a player wins the initial lag and then every game in the match. This means the player has not racked the balls all night!! 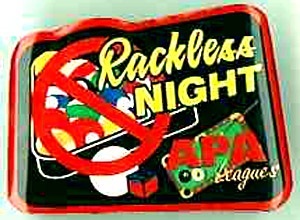 Rackless night patches are $2.00 each and the rackless night pins are also available for $3.00 each. 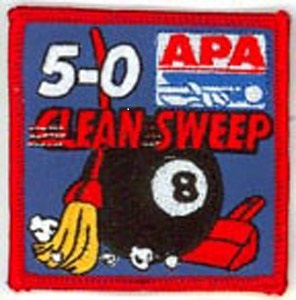 The 8 Ball Clean Sweep patch is available for 8 ball matches. Forfeits do not count. To earn the Clean Sweep, your team must play and beat your opponent in all 5 matches scheduled that night. 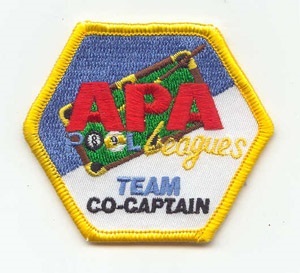 A patch is available for each team member that would like one for $2.00 each. 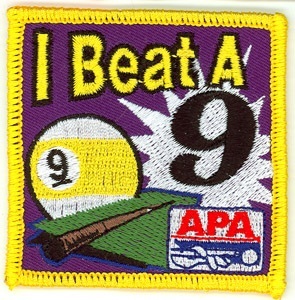 The 9 Ball Team Sweep patch is available for 9 ball matches. Forfeits do not count. To earn the Clean Sweep, your team must play and beat your opponent in all 5 matches scheduled that night. 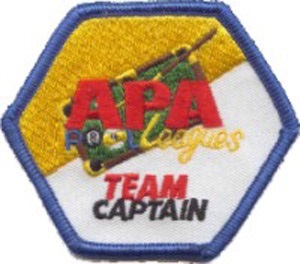 A patch is available for each team member that would like one for $2.00 each. 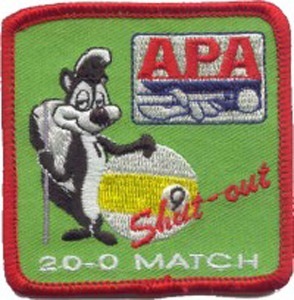 The Skunk patch is available for 9 ball only. 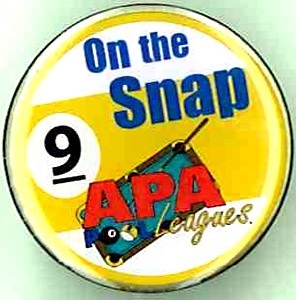 In 9 ball, a maximum of 20 points are available per match. If you hold your opponent to zero with either strong offense or great defense, then this patch is available to you. The patch is $2.00 each. 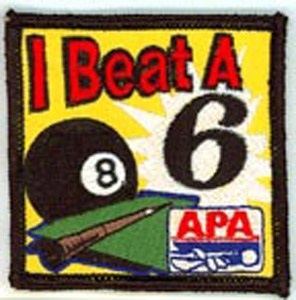 In 8 ball matches, if you beat a skill level 6 or 7, then I Beat A 6 and I Beat A 7 patches are available to you. Each patch is $2.00. 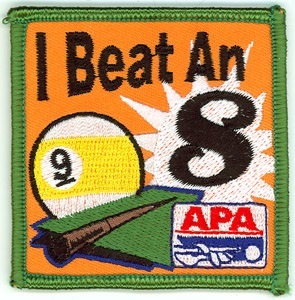 In 9 ball matches, if you beat a skill level 8 or 9, then I Beat An 8 and I Beat A 9 patches are available to you. Each patch is $2.00. 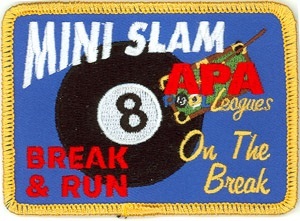 The 8 Ball Mini Slam patch is available for any player that has gotten an 8 on the break and an 8 break and run patch/pin. 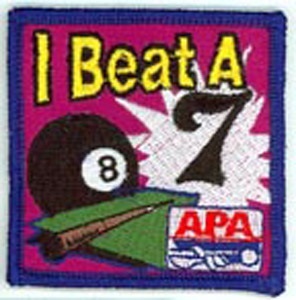 When you have accomplished this you can purchase it for $2.00 and keep your previous patches. 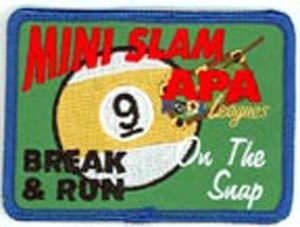 The 9 Ball Mini Slam patch is available for any player that has gotten a 9 on the snap and a 9 break and run patch/pin. When you have accomplished this you can purchase it for $2.00. 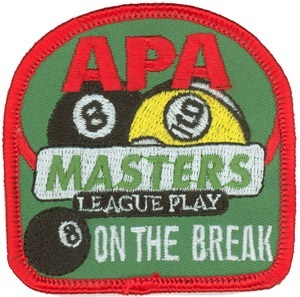 Masters 8 on the break and Masters 8 break and run patches are available when you play in a Masters Division. 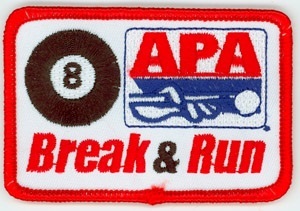 If you have not receive either patch for the first time while playing in an open 8 ball division then the first one is FREE. If you have already received your first patch for this then you can purchase one for $2.00 each. 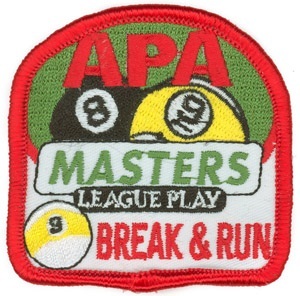 Triple Play 9 on the break and Triple Play 9 break and run patches are available when you play in a Masters Division. 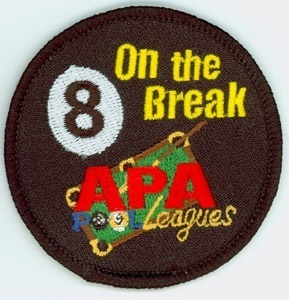 If you have not receive either patch for the first time while playing in an open 8 ball division then the first one is FREE. If you have already received your first patch for this then you can purchase one for $2.00 each. Team Captain and Co-Captain patches are available for $2.00 each if you are currently holding either one of these positions. The Division Rep patch is available for free for our current division reps upon request. 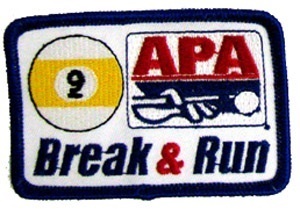 APA Iron-On Patches are available for $2.00 each and APA Lapel Pinsare available for $3.00 each. 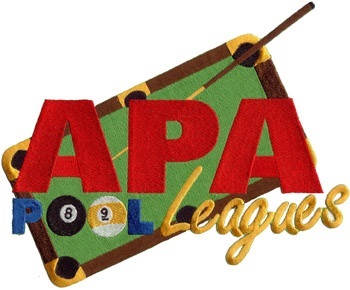 APA League Iron-On patches are available for $2.00 each.